Advanced Ultrasound Facial and Treatment for Skin and Deeper Tissue (sometimes called Ultrasonic treatment) is one of the most exciting, simple, powerful and effective method used to rejuvenate your skin. Ultrasound Facial uses very high speed, low-frequency sonic waves that generate powerful micro vibrations deep within skin cells to stimulate your skin’s natural repair mechanisms. These sonic vibrations have the beneficial effect of cleansing and exfoliating your skin. The vibrations have many benefits including improved product infusion into the skin thus restoring elasticity, clearing of pigmentation problems & dramatically improving skin texture and smoothness. All this without using chemicals, dangerous acids or other harsh abrasives. The ultrasound vibrations help to break-up follicular deposits of oil, dirt and dead cells — a veritable breeding ground for bacteria. Ultrasonic frequency has been shown to kill bacteria and decongest the pores resulting in cleaner, healthier skin. Ultrasound Facial Treatment helps stimulate and promote collagen and elastin production for more youthful skin. It also helps with hydration. 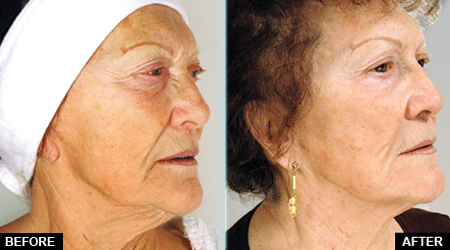 The “plumping” of the skin fills out fine lines and wrinkles. 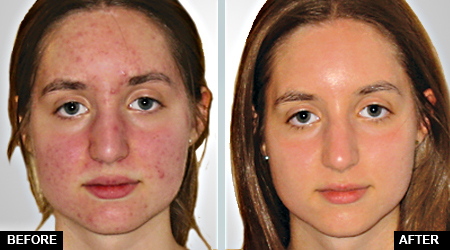 Ultrasound Facial is an excellent treatment for sensitive skin, even those with Rosacea. It is gentle and non-irritating. During the Infusion Phase, only products formulated for sensitive skin are used. No longer will your sensitive skin and/or Rosacea prevent you from exfoliating! The Final Result – When used regularly along with a quality skincare home program, your skin will be smoother, healthier and younger looking. Long-term results are achieved when Ultrasound Facial treatments and quality products are regularly applied together—and while one treatment may be all that is necessary to affect a change in some, a series of treatments may be needed by others. However, you will find the results are cumulative. As a tool for rejuvenation, ultrasound is powerful. Simple and effective. It will give you the immediate result without using harmful chemicals or exfoliates. The positive results from an Ultrasound Facial can remain for months after treatment. pain free, gentle and completely non-invasive with no down-time. Ultrasound Facial, a cutting-edge technology which utilizes low-frequency sound waves for safe mechanical exfoliation, molecular penetration to combat signs of premature aging, reduce wrinkles, clear acne, manage rosacea and control hyperpigmentation. Skin types and skin tones of all types benefit from Ultrasound Facial. In fact, clinical studies have established that Ultrasound Facial increases the efficacy of certain skin treatments by as much as 10,000 times. The most obvious extrinsic changes can be seen with acne and acne scarring, rosacea and aged skins that exhibit the most obvious visual clinical morbidity. The rapid response time for skin will vary due to genetics. However, because ultrasound has the ability to support cellular repair, increase collagen and Elastin, hydrate the skin and kill bacteria and viruses, dramatic results are seen and felt even after the first treatment. Why is ultrasound better than just doing a facial? Ultrasound also creates friction and increases local heat, which increases the activity of skin cells. By doing this, production of collagen and Elastin increases, toning the skin. Increased temperature also stimulates blood flow to the area, bringing with it more oxygen and nutrients for healing. Another benefit of increased blood flow is an increased lymph flow, removing toxins and waste products. The combined stimulative effects of ultrasound firm the skin and help breakup scars, and counteract the factors that underlie the signs of premature aging. Also, research from the New England Journal of Medicine magazine suggests that external application of an ultrasonic wave may temporarily widen the intracellular spaces of the skin’s outer barrier layer. When this is followed by application of a topical skin care product and then a second treatment of ultrasound, the rejuvenating topical agent is actively “driven” into the skin with sonic waves. No, it is completely painless. As a matter of fact, Ultrasound is a very relaxing and soothing treatment. Ultrasound is a completely safe, non-invasive and gentle treatment. However, Ultrasound treatment is not recommended for those wearing a pace maker or electrical implants. It is also not advisable if you are diagnosed with a heart condition. Treatment frequency/quantity: A series of 3-6 treatments is performed one time per week, and then maintained monthly. This service is utilized for the face and neck .